JCW has been recognised as a Top 25 Most Socially Engaged Enterprise across EMEA on Linkedin. 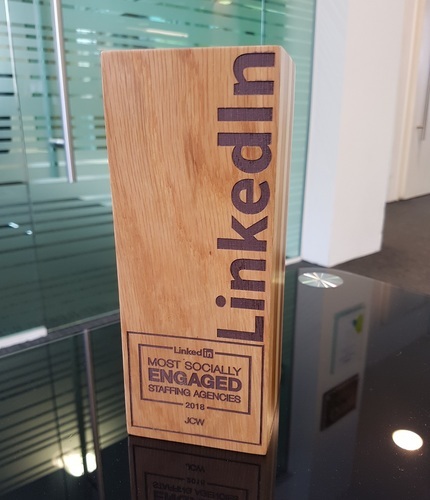 LinkedIn is the most significant digital hub for the recruitment industry so to be recognised like this on our number one social platform is a huge achievement. To achieve this, LinkedIn takes into account the social reach, employee engagement, employment brand and company content sent out by more than 38,000 search and staffing companies listed on LinkedIn. JCW pride ourselves on being trusted by talent for candidate and client service. There are many core business values and objectives that we focus on to achieve this. Building effective communications with the industry is amongst the top of that list. Communications come from many mediums and with so much digital noise out there it can be hard to stand out and be meaningful in a crowded market space. Our devices are continually beeping with notifications, so it’s essential that any from JCW are notable and relevant to our market. Winning this award means that we’ve been recognised for contacting our community with relevant content and engaging them in a manner in which they are responsive to. There are 562 million LinkedIn users worldwide with 2 people joining the platform every second. It’s the biggest business and professional networking platform in the world and people use it to connect with current and former colleagues and to build a network of thinkers, influencers and future employers in their industry. It’s a fantastic platform for e-learning and career-related news, advice and opinions. It’s a great way to build your personal brand and to have employers come to you for work which often results in better opportunities and a higher salary increase for individuals. The award now proudly sits in our hall of fame. What's next for us? Watch this space! Have you followed JCW on LinkedIn? Follow us and join over 30,000 people in your industry already benefitting from our communications today. JCW America make the Inc 5000 2018.